For over 20 years, SiliCycle Inc. has provided solutions for chromatography, analytical and organic chemistry, specializing in the development, the manufacturing and the commercialization of high value silica-based materials. SiliCycle is especially recognized for its strong know-how in purification of APIs (Active Pharmaceutical Ingredients) and high-value intermediates via silica-grafted technologies. 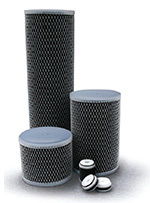 Graver Technologies offers liquid process filters, air and gas filters, crossflow membrane filters, ion exchange products, condensate polishing filters and adsorbents for a variety of industries. Both companies have high expertise in trace contaminant removal, ranging from R&D scale to industrial production, waste water, process fluids and mining refineries. In the strive of the industry and glaring needs for efficient metal removal of high value APIs and waste water, new SiliaMetS E-PAK Cartridges are perfectly compatible in standard industrial filter systems. SiliCycle, Inc. and Graver Technologies announce the pre-launch of a newly designed cartridge, especially developed for the highly effective removal of palladium (Pd) from large solution volumes and waste waters. This strategic partnership is now combining both companies’ expertise – powerful and targeted metal purification from API on one hand, and large-scale purification of solvents and waste solutions on the other hand – for extraordinary optimization of processes. More and more, time pressure associated with quickly bringing drug candidates to market has increased the number of transition metal-catalyzed reactions, which are very rapidly progressing from lead optimization, to early scale-up and even large-scale production. “Among all metal scavengers on the market, it is our technology that shows the greatest chemical, physical, thermal and mechanical robustness”, notes Dr. François Béland, head of SiliCycle R&D department. The removal of post-reaction metal residues has hence become a major issue in the pharmaceutical industry, and this is particularly true for palladium, still being the most recurring metal for PGM-catalysis. Indeed, albeit very effective and powerful, the use of such PGM-based catalysts also generate large amount of solvents containing the metal that has leached from the catalyst. Its often low concentration complicates even more the purification process, traditional methods being general and not affinity-related. The need for efficient and rapid removal of metals such as palladium has even become more critical with newly adopted final version of the Q3D guidelines that was was accepted and signed off by the ICH Steering Committee in December 2014, hence requiring the entire manufacturing industry and supply chain to meet more stringent regulations. SiliCycle functionalizes silica gels with various molecules featuring targeted affinity properties toward different metals and/or organics. Over 13 SiliaMetS showing various affinities for more than 30 different metals are available at SiliCycle. As a first step, our 2 blockbuster scavengers are available in large scale cartridge: SiliaMetS Thiol and SiliaMetS DMT. When comparing to traditional large scale strategies, such as regenerable adsorbents (which imply limited kinetics, cross contamination and low recovery), powdered adsorbents (which imply dust safety hazards, disposal/containment issues), re-crystallization (with all associated problems such as low product recovery, very high solvent usage), E-PAK cartridges have major benefits: batch operation of approximately 5-500 tons/year; removal of color, reaction-by-products and catalysts in addition to problematic metal; simple, predictable and reliable scale-up; minimum product loss; user-friendly procedures and safe operations, and so on. E-PAK cartridge housings are available in 1, 3, 7 and 12 cartridges configurations to provide high capacity and functionality within small footprint. SiliCycle Inc. was founded in 1995, and is a worldwide leader in the development, the manufacturing and the commercialization of high-value silica-based and specialty products for organic chemistry, chromatography and analytical chemistry. Its business extends to more than seventy-five countries and our customer portfolio includes companies in a wide range of markets, from pharmaceutical and biotechnologies to semi-conductors. Graver Technologies designs, develops, and manufactures products that facilitate and enhance separation, purification, and process filtration. Graver Technologies specializes in the trace contaminant removal and purification of process water, fluids, compressed air, and process gases.